The hotel has 58 spacious and comfortable bedrooms. Many facilities include restaurant, bar, indoor and outdoor pools, Fitness Centre, Wellness Spa, tennis court, bowling. Close to the beach. Discount rates online. The Best Western Hotel Maritur with 58 spacious and comfortable bedrooms is just 2 kms. 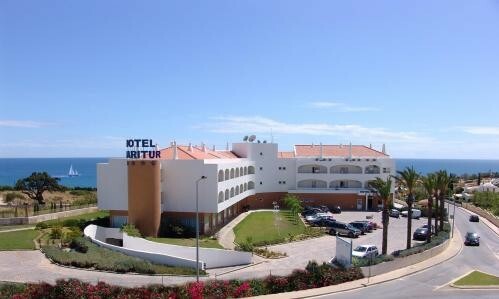 from the centre of Albufeira and a short walk from the attractive São Rafael beach. Guests will enjoy relaxing in the well appointed bedrooms with air-conditioned, satellite TV, large marble bathrooms stocked with complimentary amenities, and spacious balconies. There are a number of indoor and outdoor facilities for guests to enjoy at the Best Western Hootel Maritur including tennis, bowling, an indoor and outdoor swimming pools and a Fitness Centre. Therapeutic massages can be arranged at the Wellness Spa. The restaurant serves a large, buffet breakfast in the mornings and guests can choose from a number of international dishes for either lunch or dinner. There is adequate parking space.